The violence of Jesus’s death doesn’t save us. I recently heard a pastor announce a showing of The Passion of the Christ at his church by going into detail about the gruesome details of Jesus’s death and commending the movie for its realistic portrayal of it all. The reason why they were showing the movie at the church was so that people could see what Christ went through. 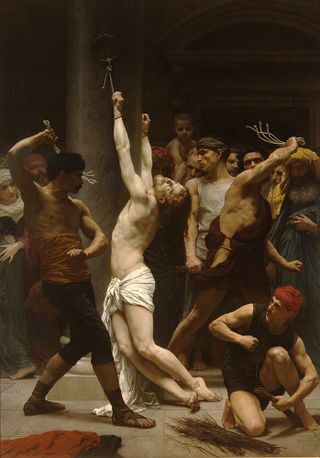 The flogging which tore apart his skin. The nails in his body. The horrible, horrible physical suffering. This is important to consider because, as the pastor put it, everything that Jesus went through was what God wanted to do to us. In other words, God wanted to beat us to a bloody pulp for our sin, but Jesus stepped in and took the beating for us. Without saying it, this pastor taught that what Jesus saved us from was not really our sin, but God. And this God wasn’t satisfied with mere death, but a tortuous execution with plenty of blood. Here’s the thing. I could probably act like a hyper-critical snobby seminary boy and critique every sermon I hear and every Bible lesson I encounter. I don’t want this blog to be like that. But. There are some things that Christians teach that must be corrected, and I count this as one of the important ones. Jesus’s death was not salvific because it was gruesome. It didn’t satisfy God because it involved lacerated flesh and punctured limbs. It was salvific because on this Man was put the sin of the world as he descended into death. In this way was it an outpouring of the wrath of God. It was not the wrath of God that led to all the blood. Now, a fair critique of The Passion of the Christ is that it focuses on the details of the torture and death of Jesus far more than the Gospels do. But, that doesn’t mean I don’t think that it can’t be a good way to teach what happened on the first Good Friday. On the contrary, if you know my story, you know that it is very important to me. The thing is, as ignorant as I was on my first viewing of the movie which changed my life so much, somehow I understood that the details of his death weren’t illustrative of what God wanted to do to me, and that they weren’t salvific in themselves. Rather, somehow I understood that the flogging and the beating and the spitting and the mocking afflicted on Jesus by the Roman soldiers was illustrative of how messed up human beings are, and this was the way the movie hit me the hardest and led me to realize I needed a Rescuer. I didn’t then and I still don’t get the impression that I am saved in Christ because he experienced great torture as he died. I think this is a distortion of the truth. As Good Friday approaches, I would rather people meditate on the reality that Christ’s death is salvific primarily because it was God taking upon himself only what he could take on, and that which we could not take on. Notice: We could take flogging, beating, and being crucified. So, say God inflicted all this violence upon us which was supposedly reserved for us anyway–that still wouldn’t save us nor would it, I think, satisfy the justice of God. People experience violent deaths all the time and we have no reason to believe that God considers it justice. It wasn’t the violence. It wasn’t the amount of blood. It was the sacrificial death through which the wrongness of the world was being dealt with–endured by the only one whose death could accomplish so much.